Developing the new generation of real estate management - LOEK! There is an enormous need for the harmonization of all kinds of processes in the real estate industry. To name just a few, the letting process, the contracting, execution, monitoring and payment of maintenance & repairs, the service costs administration and the general communication between various external parties is not executed in a way that lives up to the opportunities of the digital era. Organizations are looking for smarter, faster and safer solutions for real estate processes and data management, while complying to growing demands out of internal compliance and external regulations. 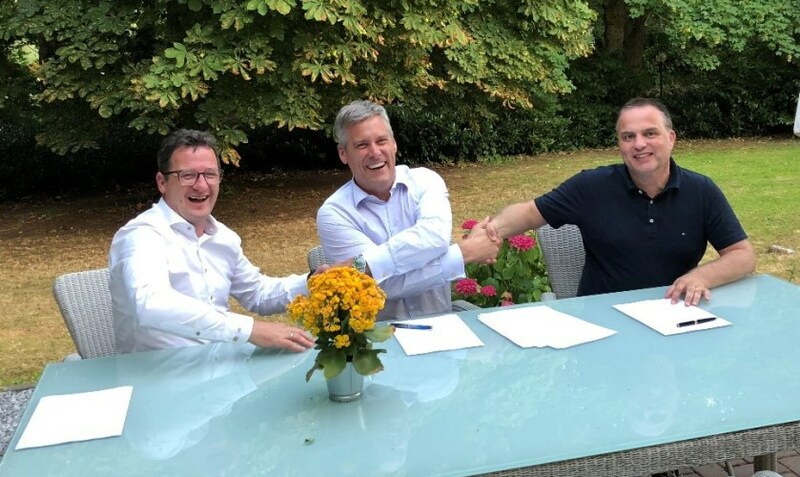 On July 10, 2018, Jörg von Ditfurth and Hendrik Aholt of Deloitte Consulting GmbH signed an exclusive agreement with Kees van Iwaarden and Johan Mastenbroek, the entrepreneurs behind LOEK!, a Dutch blockchain company that builds smart software solutions for the national and international real estate market. The co-operation is aimed at looking at real estate processes differently and to develop the new generation of collaboration software for the real estate industry. Smart software, which is capable of handling a building as an independent digital entity, which executes its own rental process and maintenance digitally, but still is 100% secured and documented. A building that enters into digital contracts with tenants and suppliers, monitors the administration and ensures optimal communication with all parties involved. A building that manages data safely and thus forms the basis for completely new business models, while complying with the existing laws and regulations. In this cooperation, Deloitte Consulting provides its knowledge and expertise in the field of real estate operations, processes and compliance and guides the implementation of this new generation of software with customers. LOEK! develops the smart software solutions and uses its blockchain network, artificial intelligence and IoT solutions, which are already operational and proven in other industries. Cautious calculations show that with this new generation of software the operating costs can be reduced by 20-30% and the real estate investment yield can be increased by 0.5-1.0%. Several national and international real estate investment managers have already expressed interest in this revolutionary development. Deloitte Consulting offers customers the opportunity to get acquainted with this new generation of software during the pilot phase.